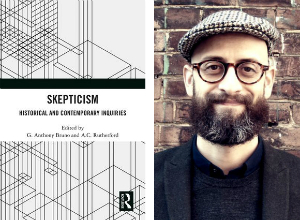 Our alumnus G. Anthony Bruno (PhD, 2013) recently joined Royal Holloway University of London as lecturer, and has now co-edited a new volume on skepticism with A. C. Rutherford titled Skepticism: Historical and Contemporary Inquiries (Routledge). The book features a chapter by Prof. Bruno himself as well as U of T professors Martin Pickavé (currently serving as Chair of our department) and Donald Ainslie (who is also principal of University College until 2019). Prof. Bruno’s areas of specialization are Kant, German Idealism, and 19th- and 20th-century continental philosophy. In his chapter, “Skepticism, Deduction, and Reason’s Maturation”, he explores the role of Humean skepticism in Kant’s transcendental deduction of the categories. Prof. Pickavé’s chapter is part of a section of the volume devoted to skepticism and knowledge, and is titled “Skeptical Arguments in the Later Middle Ages”, while Prof. Ainslie’s chapter, “Hume and the Sceptical Malady”, falls under a section concerned with forms of skepticism. Prof. Bruno’s dissertation at U of T, “The Bounds of Life: The Role of Death in Schelling’s Internal Critique of German Idealism”, was supervised by Paul Franks. After completing his dissertation and before joining McGill University as a postdoctoral fellow, Prof. Bruno was a lecturer at the UTSC philosophy department. Congratulations on the publication of this new volume, Prof. Bruno!